Coupon code 20off gets you $20.00 off the regular price in the cart. This brings your A+ Exam Simulator to just $89.00 for 577 questions! The latest CertBlaster® A+ Practice Test suite will help you prepare for CompTIA’s A+ 220-901 Hardware exam. With over 570 practice questions similar to the ones on the actual exam, this is an exceptionally comprehensive and complete practice test offering. Below find a summary of the main features of the CertBlaster A+ Practice Test product suite. 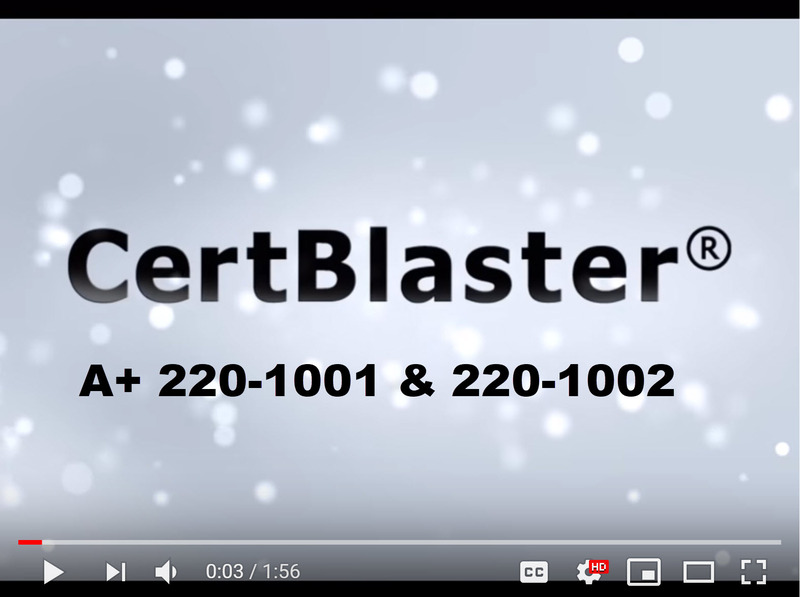 The video is a quick overview of the main features of the CertBlaster A+ bundle that contains in excess of a 1,100 questions. Here are some screenshots of Performance Based Questions in CertBlaster's A+ practice tests. 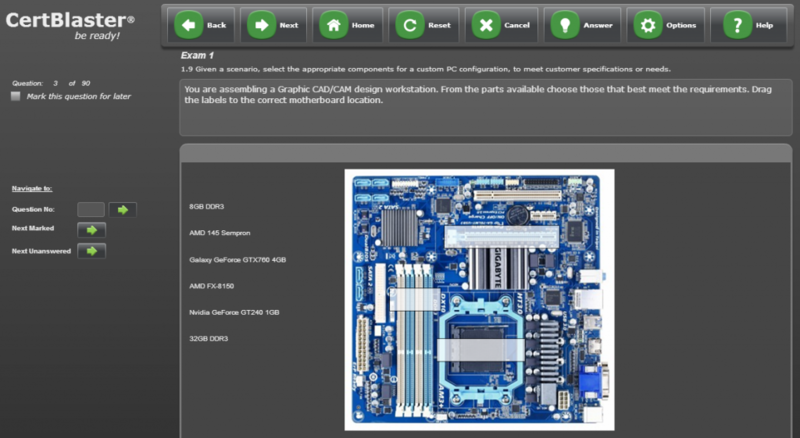 This question tests your ability to perform a custom workstation configuration based on a user's particular needs. This question addresses Exam Objective 1.9 in A+ 220-901. 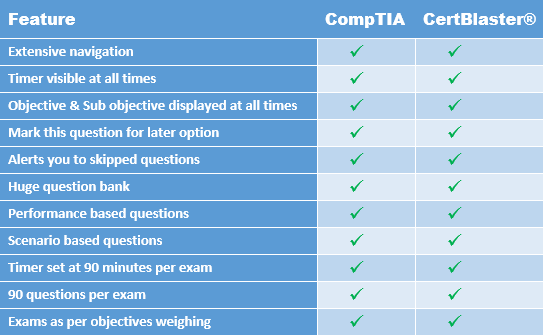 The exam objectives for the A+ 220-901 exam as defined by CompTIA are: Hardware, Networking, Mobile Devices, Printers, and Hardware & Network Troubleshooting. The exam tests your knowledge of installation, configuration, and maintenance of hardware. You are also expected to have basic networking knowledge as well as the ability to diagnose and troubleshoot hardware problems and/or malfunctions. Why should you care? Because it reveals the approximate number questions you will be facing on exam day. Knowing that the total number of questions on the exam is 90, you can deduce that “1.0 Hardware” will be about 31 questions (34% of 90), Networking 19 questions etc. 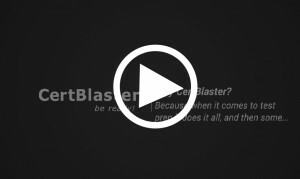 With CertBlaster you will be ready! Our practice tests will ensure you are ready for success at your A+ 220-901 exam. They include all question types you will face at the exam including the in-simulator Performance Based questions. 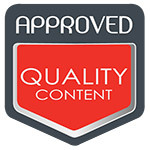 > Because we have exceptionally comprehensive A+ 220-901 practice tests: 504 questions! 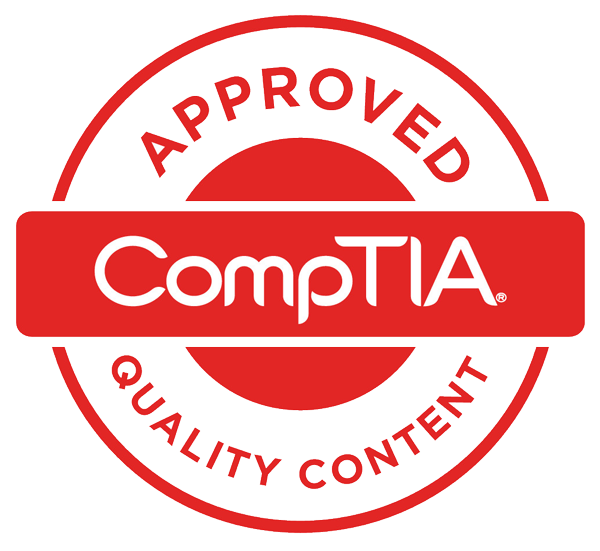 With 1,000,000 people already certified, the CompTIA A+ Exam is the most successful vendor-neutral entry level IT professional exam ever developed. CompTIA A+ 220-901 is the hardware part of the exam, you will also need the software part, A+ 220-902 to be A+ certified. It covers the fundamentals of computer technology, installation, and configuration of PC's, mobile devices and related hardware, and basic networking. It tests for the fundamentals of operating systems including Windows Vista, Windows 7, Windows 8 & 8.1, Linux, MacOS, Windows Phone and more as required of all entry-level IT Support Professionals. CompTIA A+, Network+ and Security+ certifications will be valid for three years from the date the candidate is certified. After the three years renewal will be required although there are a few ways around this. 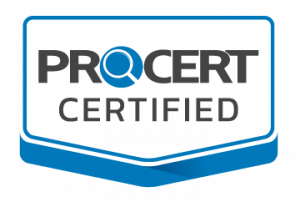 Instead of recertifying you can earn CEUs and some other certifications, would you take them, can alleviate the need to recertify, for more on this, go to CompTIA. A huge exception to this policy are candidates who certified prior to January 1, 2011. If you did, you are certified for life!